Transit Supervisor Rogelio Hernandez, City Commissioner Margaret Romero, City Manager Jim Scholl, Mayor Craig Cates, FTA Regional Administrator Dr. Yvette Taylor. City Commissioners Billy Wardlow and Sam Kaufman, Transit Director Norman Whitaker. 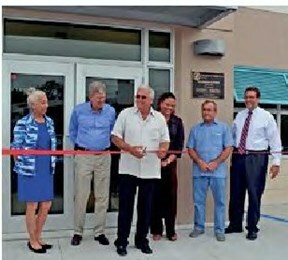 City, state and federal officials joined in the celebration Monday as the City of Key West cut a ribbon on the new transit facility on College Road. With the help of grants from the FTA and the FDOT, this state-of-the-art facility will provide better service to the community.